Today's Draw Classic*: Judgment from the Victorian Romantic. What role were you cast in in your family? What parts of that role have you claimed as "you"? And what parts have you escaped from? Whenever I draw a card I don't want to write about, I take notice. Because inevitably there's a timely message in there for me. Such is the case with today's card. There are really a lot of ways to interpret this card. Usually the way I interpret it is that it's time to change an aspect of yourself you can no longer deny. The meaning that struck me today is similar, but a little different. It's not so much about things I can no longer deny as can no longer avoid. For my own well-being. 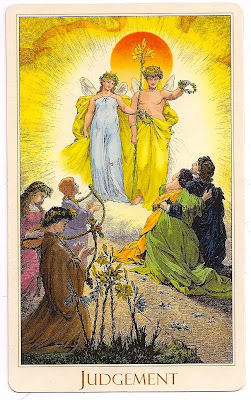 The card depicts angels calling on the dead and forgiving their sins so they can rise to heaven. This is representative of our past wounds we never let heal, sins we refuse to forgive and bad habits we never get around to losing. Within most of us, there's something from our past that it's time to lift up and let go of. I believe one of the hardest things to discern in life is where others' characterizations of, and aspirations for, you end and where your authentic self begins. By this, I mean that much of our self image is shaped in our early years. And a lot of it is based on what we're told about ourselves and how we're treated by others. In a family unit, for example, you have a role. I'll forever be "the baby" and be characterized as such in one regard or another among my siblings. An example of this is the perception of my selfishness, meant to suggest I never do anything for others. (I happen to believe none of does anything that doesn't ultimately serve us, and therefore we're all "selfish", but I won't get into that now.) Sometimes I feel like no matter how compassionate, understanding, wise or whatever else I become, I'll always be dogged by the "spoiled, selfish baby" role I was cast in before I even knew how to talk. I'll never know if the path I've chosen as an adult is in an attempt to run away from that, or in an attempt to become who I really am and was always meant to be. The line is that thin. We're either who we've been cast as or we're escaping from it. And either way, on some level, even if it's entirely subconscious, we're shaped by the early assessments of others. I don't think we can ever separate ourselves by who we would have been "if", because "if" never happens. Even if you're literally raised by wolves, you're imprinted by your place in the pack. In the end, we are what we allow ourselves to be and we have to take responsibility for it. Ultimately Judgment is a card about taking that inventory, taking responsibility and deciding who you want to be from this moment forward—regardless of who your parents, siblings, children or spouse expect you to be....and regardless of whether or not they'll ever allow you to be that person in their own minds. You may have many go-rounds on this earth, but you only get one chance to be YOU. This moment of Judgment is cyclical in that it comes around multiple times in our lives as we move ever higher in our personal evolution. It's here for me now and I pray I have the courage and strength to break free of some of the chains I've allowed to bind me throughout my life. And one of these bigger things is that, regardless of whether I'm fulfilling prophesies or running from them, I place judgments on it. I think to myself that if I died without accepting and loving these last few things I can't seem to get past, I will have never lived.